The weather is having mood swings again: The trees all flowered in last week’s heat and now aren’t they sorry, some of them! Like our magnolia that usually doesn’t flower ’til mid-April. 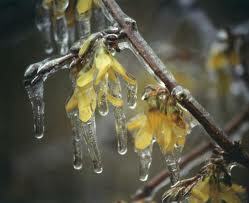 Its blossoms emerged around the twenty-second day of March and five days later temperatures plummeted to a frigid 20°. Now they look like so many antique ladies’ gloves, limp and sepia-colored. The apple and cherry tress came out too and that doesn’t happen around here until May. Oddly enough they went right on looking gorgeous, freeze or no freeze, with their little branches all sewn with living popcorn. Some of the daffodils fell on their swords but not all. Last night when my head hit the pillow I felt like flopping over dead myself. It’s how you feel on a Friday night. Now it’s new day and almost a new month. Meantime, could you ever watch this flower-dying footage without a stab to the heart? It’s about one minute into the opening sequence of Alan Ball’s award-winning HBO series Six Feet Under. Crazy idea that things die and stay dead, when even those poor limp magnolia blossoms know they’ll all be back next year! Not quite a new month I hope because I’m having people for Brunch on the 1st and its tomorrow! Isn’t it? Come in Rangoon! whoops thanks RJ! Corrected it now! That’s what I get for trying to compose at 3am!